Ordered some glasses online from clearlycontacts.ca. My optometrist would not give me my PD measurement. Fortunately there are ways to measure your PD yourself—I like Ken's Post-It method. 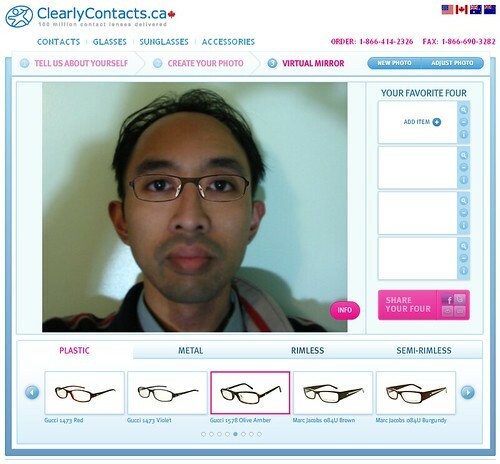 ClearlyContacts (or CoastalContacts in the US) is cool because you can try glasses on a photo of yourself, you can return the glasses if you don’t like them, and all lenses are antireflective, antiscratch, and UV. My frames and lenses came out to $100, but because of the high prescription I opted to pay another $100 for an ultra-thin lens. $200 ain’t bad for a pair of glasses. Here’s me trying on some Guccis. posted by Jonathan at 10/19/2009 11:58:00 p.m.